BROWNSBURG, Ind. – FBI agents raided the home of an Indiana man Tuesday accused of attempting to provide aid to the Islamic State. 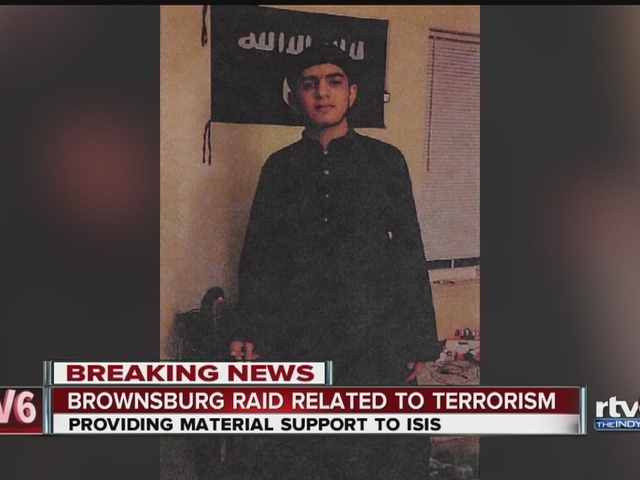 The raid was conducted at the residence of 18-year-old Akram Musleh at the Brownsburg Pointe Apartments in Brownsburg, Indiana. According to a criminal complaint filed Tuesday, Musleh is U.S.-born citizen who attended Brownsburg High School. The FBI alleges Musleh booked or attempted to book several one-way flights to Iraq and Turkey, but never completed the flights. They also allege communications intercepted from Musleh indicated he was attempting to travel to the Middle East to join the Islamic State. In addition to trying to travel to the Middle East, the FBI alleges Musleh "conducted extensive internet searches on explosive materials, including: dynamite, flash powder, explosive precursors, instructions on constructing explosive devices and explosive chemical recipes." An agent conducting surveillance on Musleh reportedly observed him shopping for pressure cookers at the Brownsburg Walmart. The criminal complaint includes a number of alleged conversations between Musleh and an unidentified person in which Musleh expresses his desire to be in an Islamic State propaganda video. The two also allegedly discussed the possibility of Musleh attacking a "drone place." FBI agents obtained a court order in May to search Musleh's phone. Investigators reportedly recovered files related to jihad, martyrdom and the Islamic State on the device. The phone also contained several audio files of lectures by Anwar Al-Awlaki – a Yemeni-American imam accused of being a senior recruiter and planner for al-Qaeda. On June 3, the FBI says Musleh booked a one-way ticket from Casablanca, Morocco, on July 21to New York City. Agents arrested Musleh Tuesday as he was boarding a Greyhound bus in Indianapolis.